You know this guy is really cool as soon as you see him. 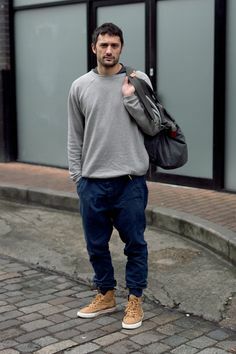 He simply took a gray fitted hoody (notice that fitted hoodys look great and really cool on both guys and girls) and complimented it with my favorite colored pants for men, which have just a touch of sag to them, and clean white kicks. Owning a pair of white kicks is an excellent idea, for they go with everything and spice up a dull colored outfit. Girls: you may recognize this pretty face from Vampire Diaries, but guys, take a look at this great outfit. Striped shirts of any kind are a must have in your closet, they are snazzy and absolutely delightful, plus girls love stripes on guys. Over the striped shirt he wears a white cardigan. 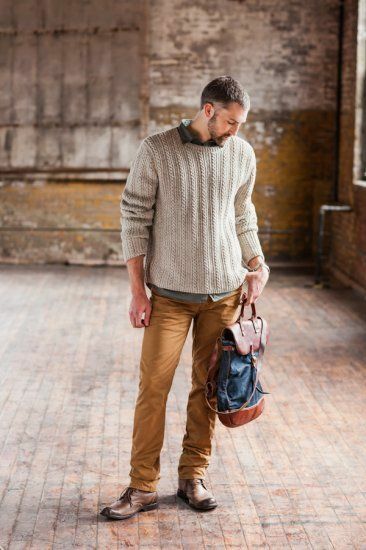 Now I admit that a cardigan may be a difficult piece for a regular guy to pull off, but it really completes his outfit and gives a look of comfort. But of course the best item from this outfit is the combat boots…um hot. High five to the stylist. You can team combat boots up with formal attire or a simple jeans and T-shirt look. The best way to wear them is by tucking in your jeans into your boots. But avoid overly saggy or buggy jeans. 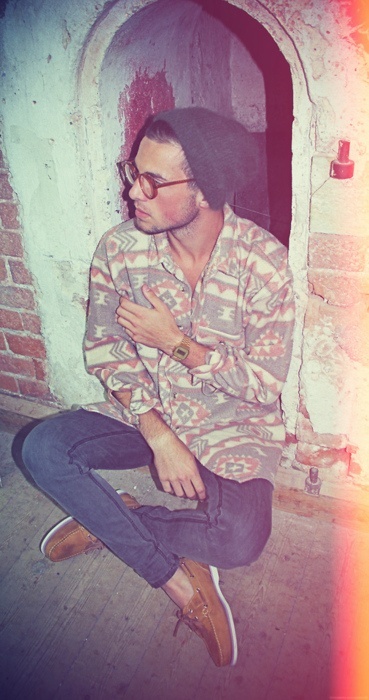 Bring out your inner hipster with this kind of an outfit. Who knows, maybe it’ll be your thing? This gentleman wears a washed-down tribal print button down with rolled-up sleeves. Since the shirt is rather large, he paired it with skinny jeans. If skinny jeans are out of your comfort zone, then you can try fitted pants. Fitted pants are the balance between skinny or and saggy. If you are having a bad hair day, a beanie would be perfect to hid that hair, but it also looks great in general, and with almost any casual outfit. To avoid looking cheap and rugged, he wore nice boat shoes. Those are sweat pants but they’re not! You gotta love those pants. He matched a long sleeve black shirt with a white shirt under it and really sweet black and white shoes. Wonderful. I always say that layering is really important. One of the easiest layers you could do is take a collared long sleeve and slip it under a sweater one or two times bigger. The collared shirt can be a different pattern or color, experiment! That about covers it! Good luck!